I recently had a chance to troubleshoot a controller display with very high emissions in the 90 to 300 MHz region. This was a product inherited from an acquisition, so they had to fix the design after the fact – not an uncommon situation. I’ve dealt with the issue of radiating LCD displays before, so had some ideas on an approach already. LCD displays use a high-speed “dot clock” signal to drive the individual pixel elements. This is frequently in the order of a few hundred MHz and is routed via a ribbon cable from the clock driver and processor circuitry. Unfortunately, and for reasons beyond me, most LCD display modules are generally comprised of a sandwich of two floating pieces of aluminum – a front bezel and rear shield and mounting plate. 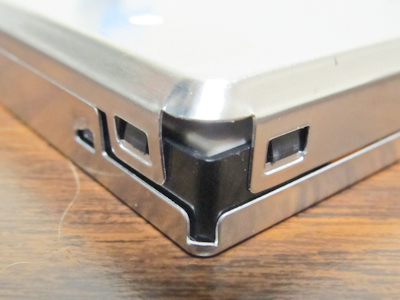 These plates often have a gap between them as well as sometimes lacking a bonding connection back to the chassis or product enclosure. This results in “floating pieces of metal”, which couple energy and radiate. On top of that, the OEM display assembly was packaged in a plastic enclosure, which was inserted into a large rectangular hole in the metallic controller housing and clamped from the rear. In other words, we have this large radiating assembly with no easy way to bond it to the primary metal controller housing! I first probed around the whole assembly to confirm the ribbon cable and front bezel were the dominant radiators. I used the Beehive Electronics h-field probes connected directly to the handheld TTi PSA2701T spectrum analyzer. This took just a few minutes and proved the cable was the “hottest”, with large emissions also radiating out the front of the display. Closeup showing the ferrite choke on the dot-clock cable. I treated the dot-clock cable first, because that was easiest. Unplugging the cable from the PC board, I slipped a small flat ferrite choke (Laird 28R0898-100) over the cable and reconnected it. This immediately reduced the emissions as much as 12 dB. The was no effect on the display quality. The lower frequencies, while improved, were still fairly high, so the next step was to disassemble the display getting right down to the LCD module itself. After confirming the front bezel and rear shield were indeed floating, I used copper tape to temporarily bond the two together. I then confirmed the LCD module was supported by plastic pins, so was not bonded to the rest of the display assembly. I took additional copper tape and ran it between the rear shield of the LVD module and steel sub-chassis of the display. I also ran several pieces out from the sub-chassis to the inside of the metal enclosure. The result was that all metal pieces were now bonded together. After connecting the tape to the enclosure, the emissions had been reduced from 9 to 25 dB! We later “cost-reduced” by removing most of the unnecessary fixes. After a few experiments, we were able to remove all the copper bonding between the display assembly and controller housing, but the two nearest the source. After eight hours work…a compliant product! 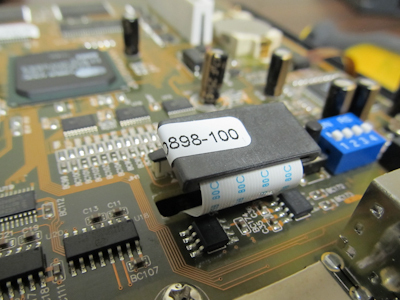 Closeup of the corner of the LCD module, showing the gap around the edge of the module. Copper tape was temporarily applied as a troubleshooting fix. Thanks for this informative case study. Your explanations of the diagnostic procedure and results were clear. A few more pictures of the fixes implemented and a plot of the measured data before and after the fixes would have been helpful. I am looking forward to your next case study. Thanks for the suggestion Tom. I’ll keep that in mind for the future. Hi Mark, it’s great you were able to modify the guts of the display to achieve lower emissions. Most companies using OEM display modules wouldn’t have that luxury, unfortunately. It seems LCDs are a common problem across the board as far as emissions go. Yes, I’d bond the metal framework of the display to chassis ground, if at all possible. I’ve had products reduce their emissions by several dB by doing so. Remember, floating metal can act as a nice antenna if RF energy is coupled to it! Kenneth, thanks for the feedback. Sorry my comment was a bit misleading I modified our driver PCB prior to our LCD interface connector – the LCD is an OEM module. I will try the bonding today – the LCD sits in a metal frame so I can simply add some gasket around the edge to ensure that it is bonded all around. One neglected point about LCDs and radiated emissions is how the harmonics shift depending on the image displayed. I have created a few test bitmaps with different patterns with a view to exciting the data lines at different frequencies – the difference between a solid white screen and black/white pattern alternating pixel by pixel is significant! When it comes to compliance testing there doesn’t appear to be a standard ‘test image’ to use so I guess it is up to us product manufacturers to test some representative examples and go with what is worse. Hi Mark, I remember in the early days of testing PCs, there was some standard set of repeating characters the FCC wanted to use. I don’t believe that applies any more, now that we all have bit-mapped displays. I would just try some setups as you’ve described and determine a worst-case scenario. An alternative, of course, would be to set up the display with a typical control panel (assuming this is some sort of controller or test instrument). If the product can display anything, then you’re already on the right track. Let me know how well the bonding reduces the emissions! Copper or aluminum foil makes a good troubleshooting tool. While we didn’t try it in this case, it would have made a difference.